Every so often that book comes along, one you were eager to read, one that you wanted to enjoy, perhaps even love, but things didn’t turn out like you expected. 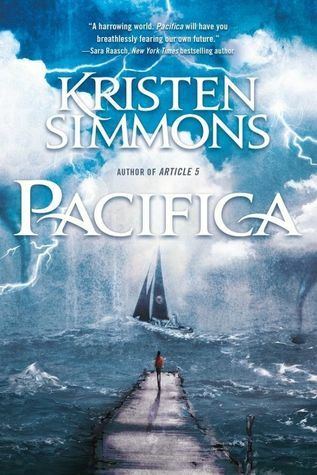 Sadly, that was the case for me with Kristen Simmons’ Pacifica. I had finished The Glass Arrow mere days ago and really liked it and I was eager to read something else from her and since this was in my TBR pile I thought I’d read it straight away. The story had promises of an adventure, one at the high seas in a world that has greatly changed over the past centuries. The world isn’t safe, it’s barely habitable, but when the president’s son, Ross, hears that his best friend has been taken to be sent to an island that claims to be a refuge for select citizens, he’s determined to get him back, at whatever the costs. He recruits Marin, a girl from the streets who saw what happened to him and just happens to be the daughter of a pirate…not that he knows this right away. Marin is in it simply for the money, for she struggles to get by in this desolate world. She also has friends, most involving young children who are going hungry and the money that Ross promises to pay upon finding or not finding his friend could keep them fed for a long time, it’s too good of an opportunity to pass up. All the makings for a great read, right? Well, perhaps it was, as I only managed to get through 177 pages before I just lost interest, mostly because of the pacing. I can read books that aren’t all action packed, some of them even become favorites. For some reason, the slower pacing in this one totally bogged me down. The description I was given of this story made it sound like it would be a high seas adventure as Marin and Ross are racing to save his best friend, yet, they don’t actually get out onto the sea until about 160 pages, so you can imagine how hard it was to get through what basically feels like a prequel almost. True, a certain amount of pages set up the danger that Ross’ friend got into, but that was maybe 15 pages or so, you still figure it’s about 150 pages of prequel worthy material. While I am definitely a character driven reader, the plot also matters, if I can’t get into the adventure the characters are about to embark on, I can’t really care what will happen to them, even if I like them from the short amount of time that I spent with them. That’s what happened here, sadly. I thought surely by 50 pages we’d be out at sea facing harrowing and terrifying dangers, perhaps learning about the mystery of where these people are headed since, supposedly, the place they are headed to doesn’t exist. It took a lot longer than 50 pages before Marin and Ross headed out to sea and though I tried to hang on even after that, they hit yet another roadblock to put their journey on hold, yet again. I wanted to like this book. I wanted to love this book. But for whatever reason, I just wasn’t jiving with this slower pace this time around. Usually, I can handle it if there’s something else of importance going on that holds my attention. What was happening here was Ross wanting to know where his best friend was and Marin trying to figure out what she could do to save her family now that her previous plan to make money was destroyed. It was just so hard to slug through what felt like mundane happenings before getting onto the actual adventure and then to have it derailed within pages of setting out. I won’t say this has scared me off of Kristen’s books, as I was pretty much all ready to dive into her books again having enjoyed The Glass Arrow. But sadly, Pacifica wasn’t at all what I thought it would be. Perhaps I did stop just when things were bound to get good, but I can’t help but feel let down that I had to wade through 150 pages before the adventure actually takes off. While this read wasn’t for me, I would still encourage you to give it a try if it sounds like one you might enjoy. Just be wary that the story does take a while to actually set off on its course. If you’re a more patient reader than I am, then I would think you’d have no trouble getting into this most promising story! As I tend to do with DNF reviews, I will not give this one a rating as I didn’t finish it. Though I did read a significant amount to write this kind of review, I just wanted to share my thoughts on what I did read. It's so sad when your expectations of what the book is don't match up with how its written. I agree, based on the description, it sounds like it's full of action! I would be disappointed too. Hopefully you're onto a better read! Ah booo sorry this wasn't for you Jessica! I actually saw Kristen on Sunday! I hate DNF books... I never know how to review them. You did a fabulous job with this one. Hate that you didn't finish it.